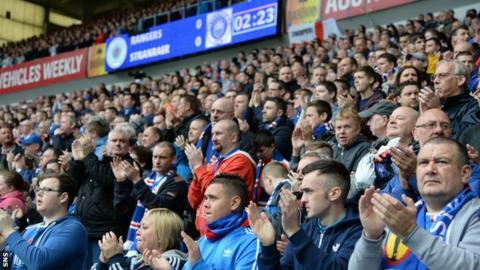 Rangers supporters are confronting a quandary: the club is clearly in financial difficulties, but buying season tickets will merely prolong the influence of those shareholders who have overseen the progress towards this fraught situation. How many fans renew will determine how long the current regime can last without seeking external finance. That reality was made starkly clear in the summary of Graham Wallace's business review published last Friday. It was already evident from the interim results, released last March, but in truth raising investment through equity finance has been the only viable solution for Rangers since before last December's annual general meeting. The shareholders did not vote to allow the directors permission to hold a rights issue, but there has been nothing to stop seeking that authority again in the meantime. Without that additional financing, most of which would be unlikely to come from current shareholders given the extent of their losses so far, Rangers would be restricted in the club's rebuilding plans. The 43,400,000 currently unissued shares could be sold on a pre-emptive basis to current shareholders, but non-shareholders, like Dave King, could acquire the rights to participate. Even so, the shares would be sold at a discounted market value, and so would raise only around £9.5m. For all the noise there has been around individual personalities, the fundamental issue at Ibrox has always been finance - why it was running out and why sufficient attempts have not been made to address the need for new money. Wallace has been a chief executive under siege since the release of his report, with Police Scotland looking into a complaint from a shareholder that Wallace misled shareholders at the AGM when he announced that there was enough cash in the bank to last until May, only to seek an emergency loan from two shareholders in February. The club insist that the complaint has "no grounds". Rangers fans need to make sense of the situation their club is in, if they are to make a decision on renewing. They cannot do so by credit or debit card, because the finance company that would have processed the payments was so concerned about the club's annual accounts last year, and the situation that prompted Wallace's idea that the players might take a 15% pay cut, that they sought security over Ibrox to protect them in the event of insolvency. By suggesting this situation was due to supporters' group Union of Fans' initiative to set up a season ticket trust fund as an alternative to renewing - which happened one month after FirstData raised their concerns - Wallace further damaged his relationship with the club's support. Fans cannot be certain that the money they spend on their season tickets will ensure that the club remains a going concern for the next 12 months, and nor will it be protected. If the heart says renew, out of habit and a sense of loyalty, the head may likely say wait, at least until the extended 16 May deadline. By that stage, the directors will have a clear understanding of the rate of uptake, and so know how imminent their crisis point is. May and June are also the months when player bonuses are due and when contractual wage increases begin. Historically, season ticket revenue - from all the different forms of payment - does not normally arrive in significant amounts until July and August. There are vocal groups amongst the Rangers fan base in opposition to each other online, and a larger silent majority whose intentions will only become clear in time. So what might happen? The board has been unable to find an alternative to King - who is on record saying he is prepared to invest up to £30m, but would do so on his terms, and in control - and so they can either engage with him now, wait until the club is teetering on the very edge of a crisis, or muddle through to the autumn, when Wallace's stated intention is to seek shareholder authority for a rights issue. This would most likely need to be underwritten, since so many Rangers shares are held by individuals and even if some of the institutional investors were prepared to put more money in, that alone may not raise enough finance. The shareholders who aligned themselves round Sandy Easdale last December could sell their almost 25% stake, but on current market value that's only worth £3.6m. They have never shown any inclination to sell at that kind of price. Buying any holding smaller than 25% does not allow King the control he needs. So Rangers fans are left with the ultimate power, of renewing or withholding. Administration cannot be discounted, given the precarious nature of the finances, but it can be avoided. Change will need to come at shareholder level, as King has always stressed, and the impasse remains there for now.